I’ve been using the same pin cushion since I was a little kid. It’s blue and square and I made it with my Gramma when I was, maybe, 7 years old. It’s the only one I’ve ever used, and I’ve been reluctant to give it up because it holds so much sentimental value. But it’s 20 years old and wearing out. 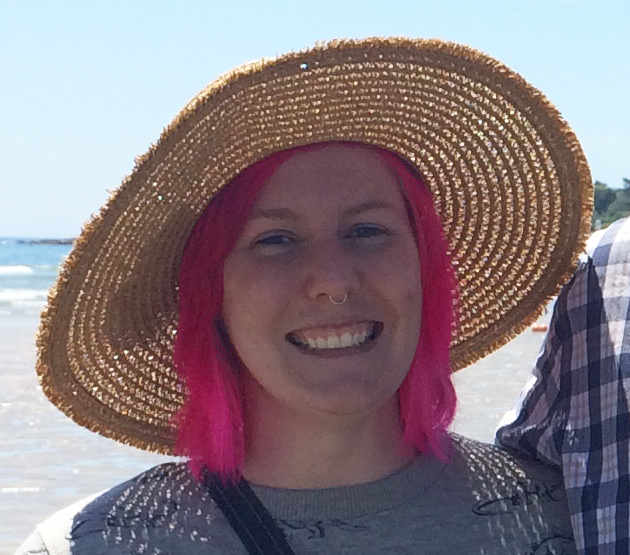 If I’m going to try to transition away from it, it’ll need a pretty awesome replacement. Then I thought, “Dinosaurs are pretty cool. 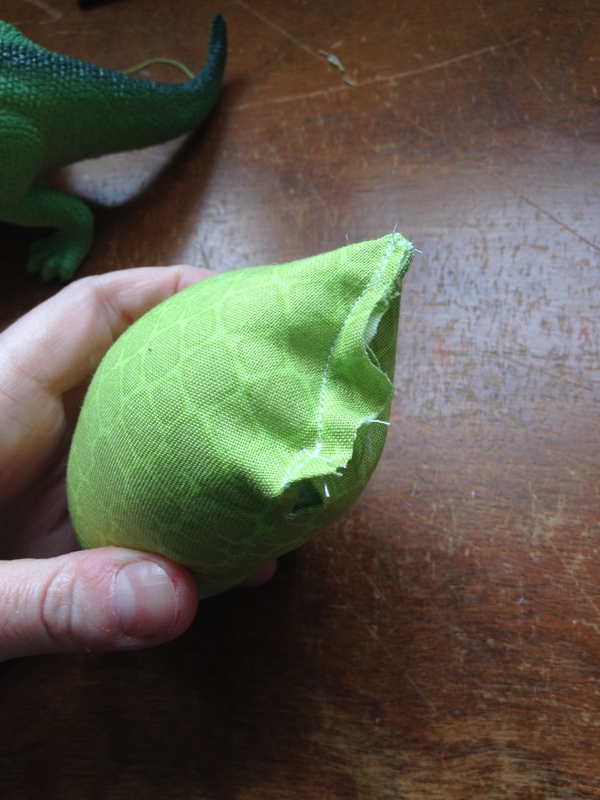 I’ve seen dinosaur pin cushions before. 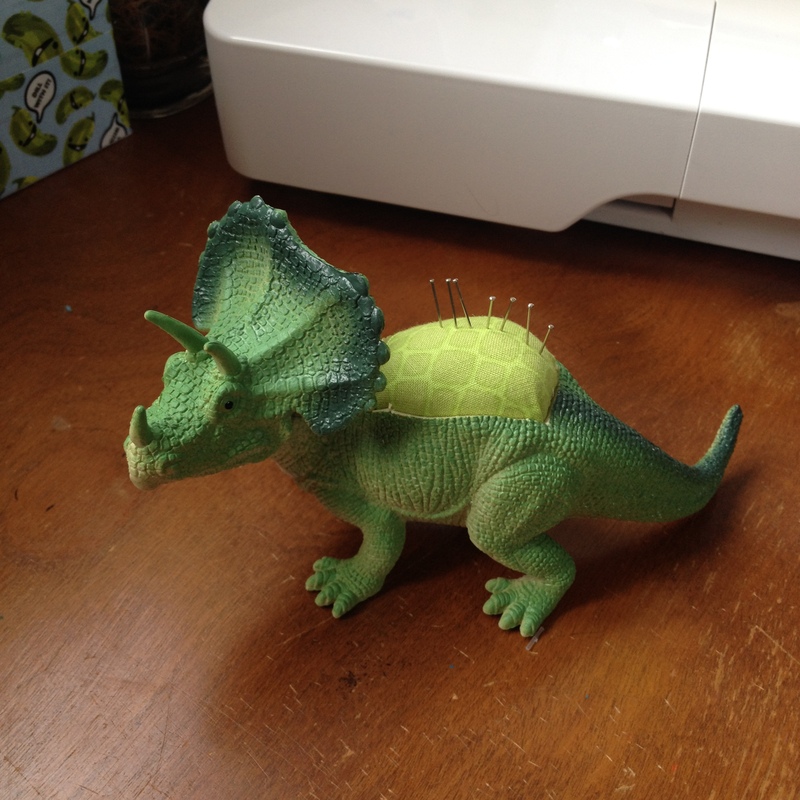 I bet I could figure that out.” So let’s make a dino pin cushion! 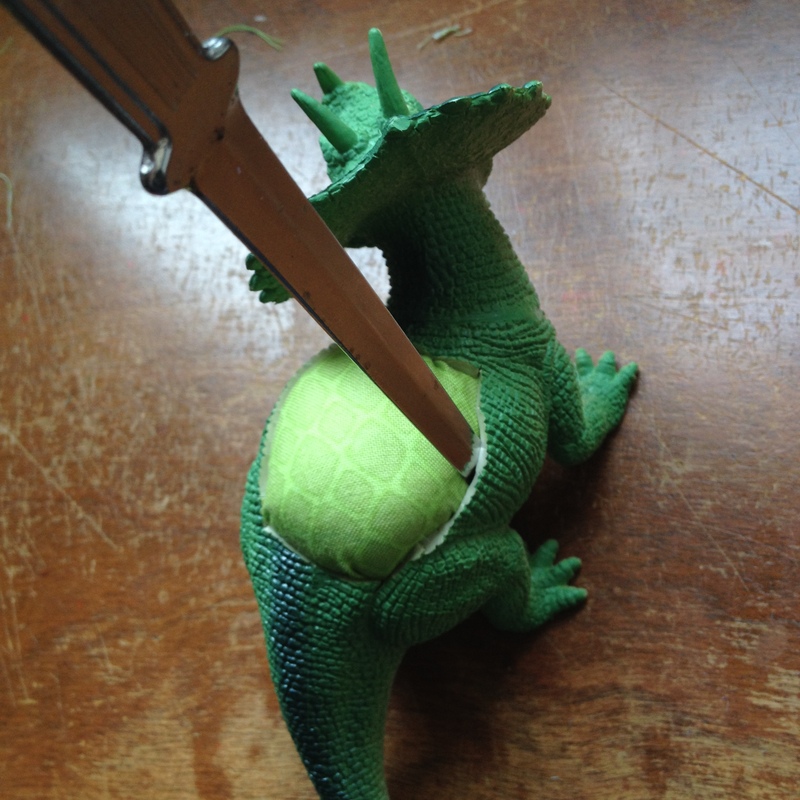 – something to tuck in fabric with, I used a letter opener. 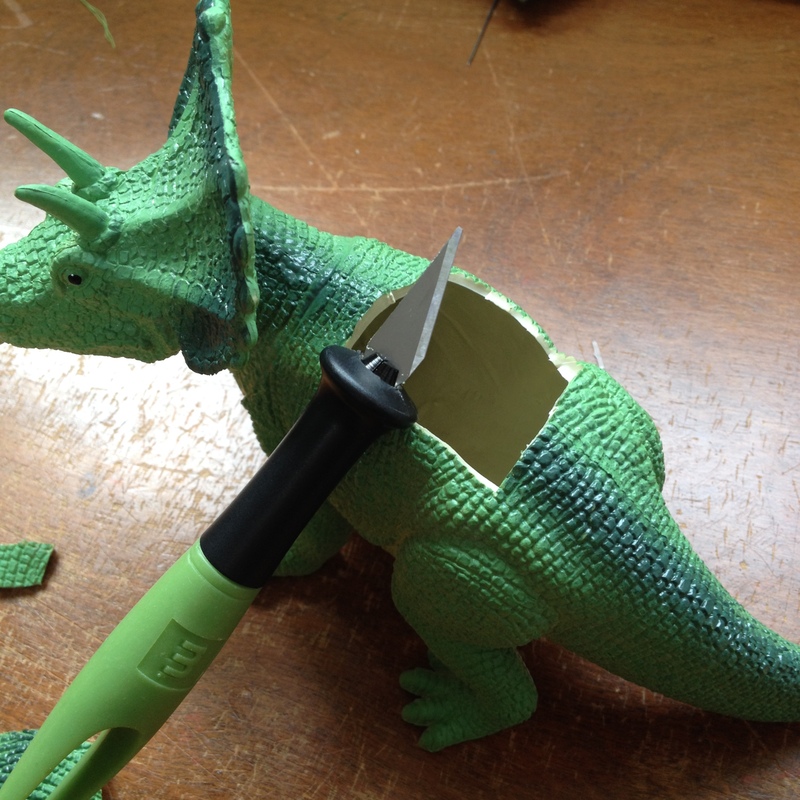 1) First, cut a square out of your animals back. 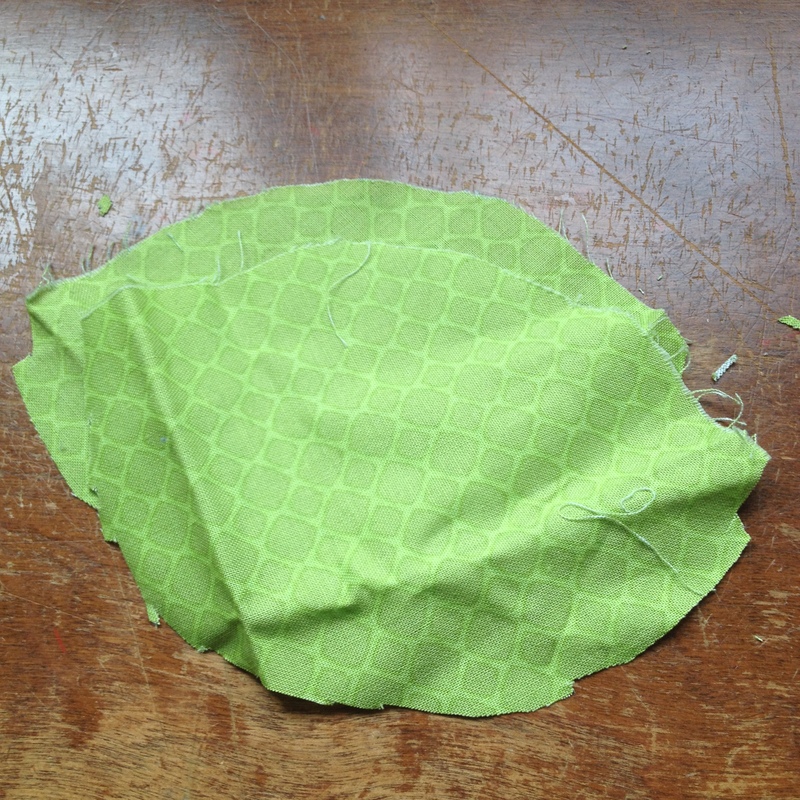 2) Sew your scrap fabric together, leaving an opening to fill it with stuffing. 4) Sewing it shut! Don’t worry about how neat it looks. You’ll be hiding this raw edge inside your animal. 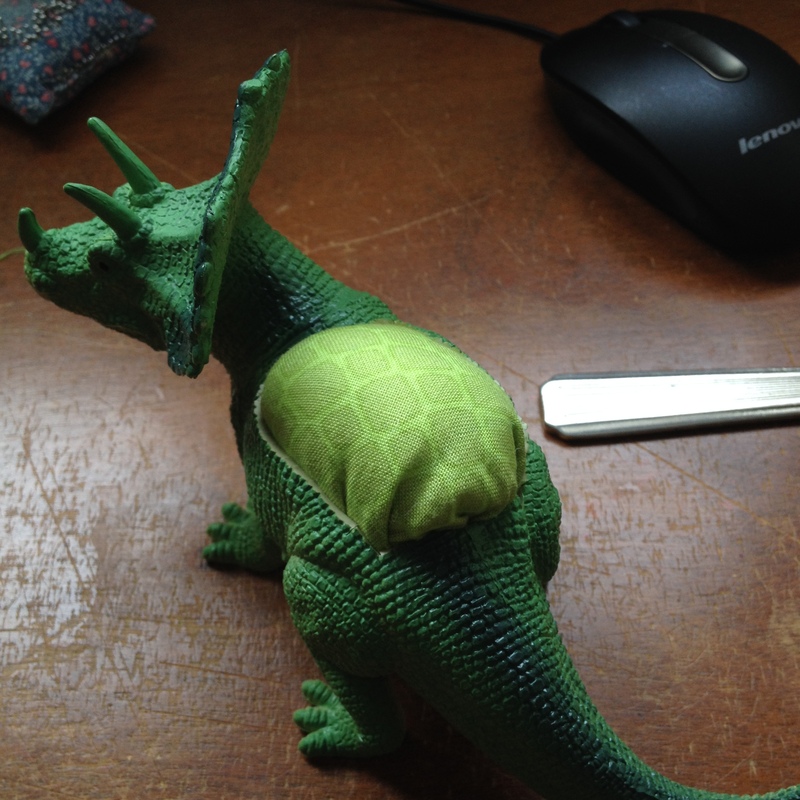 5) Stuff your little cushion into your animal. Be careful! Some of the plastic edges might be shark and I cut myself several times while trying to maneuver it in. 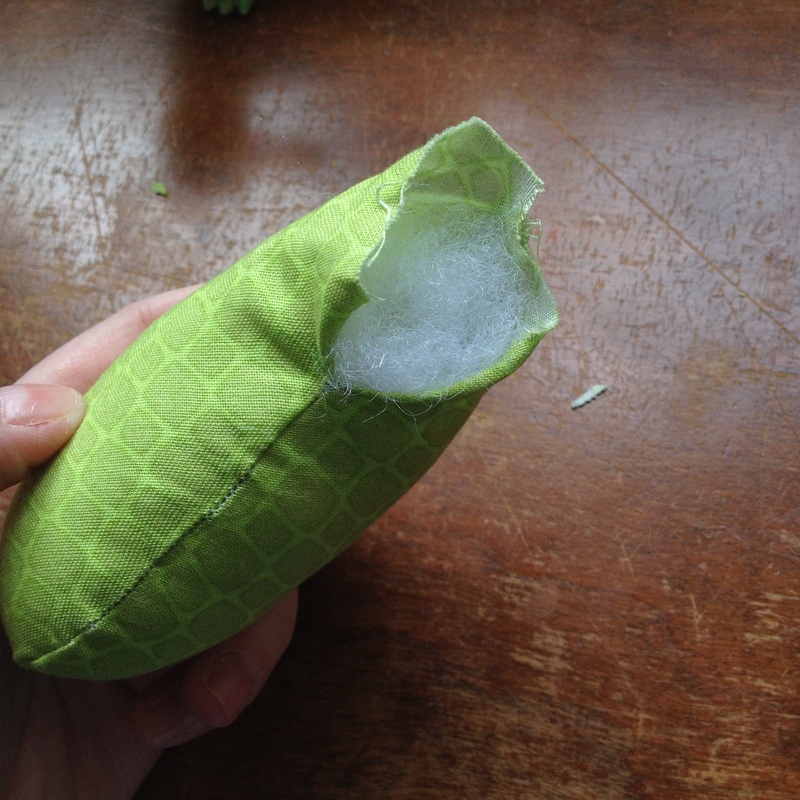 You might also find that you have too much stuffing to work with and have to take a little bit out (that happened with one of the other ones I made). 6) Tuck in the sides to make it look neat and pretty. And you’re done! Gift to a crafty friend or use it yourself. I think if I make more of these, I’ll try to cut the back pieces out at a bit of an angle, so there isn’t such a noticeable edge on them. I would also probably glue the cushion in, although these are packed so tightly it would be hard to pry them out. 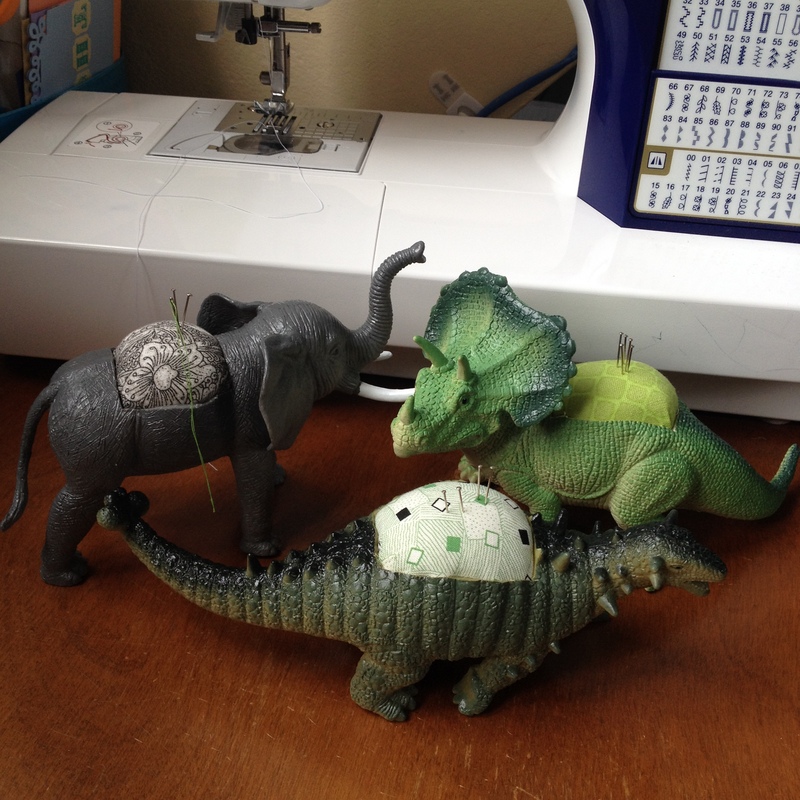 I’ve got the Triceratops in use now (the transition is not a smooth one) and the elephant I passed along to a friend. 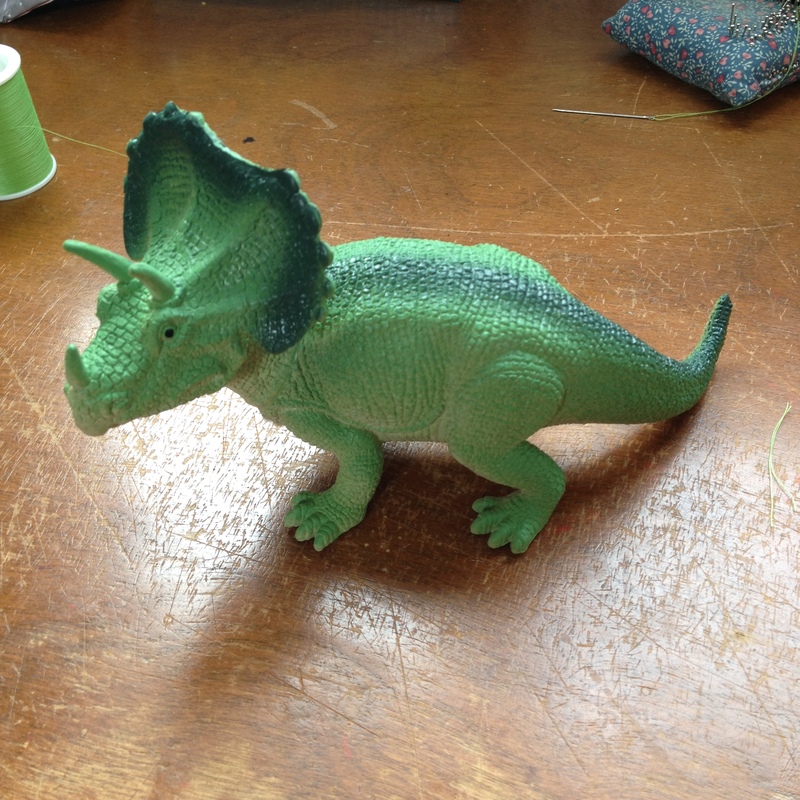 But if anyone is interested in the Euoplocephalus let me know and I’ll mail him out to you!